Note: Ethanol volumes do not include gasoline that must be added to denature ethanol, rendering it undrinkable and therefore taxable as fuel rather than as beverage alcohol. In 2014, U.S. fuel ethanol production reached 14.3 billion gallons of ethanol fuel, the highest level ever. The growth in U.S. fuel ethanol production has outpaced growth in corn consumed as feedstock—as the industry has grown, it has become more efficient, using fewer bushels of corn to produce a gallon of ethanol. If ethanol plant yields per bushel of corn in 2014 had remained at 1997 levels (when ethanol made up just 1% of the total U.S. motor gasoline supply), the ethanol industry would have needed to grind an additional 343 million bushels, or 7% more corn, to produce the same volume of fuel. To supply this incremental quantity of corn without withdrawing bushels from other uses would have required 2.2 million additional acres of corn to be cultivated, an area roughly equivalent to half the land area of New Jersey. Several factors contributed to the yield increases from a bushel of corn. Increased scale has allowed producers to incorporate better process technology, such as finer grinding of corn to increase starch conversion and improved temperature control of fermentation to optimize yeast productivity. The growth of the corn ethanol industry also enabled the development of better enzymes and yeast strains for improved output per bushel of corn. 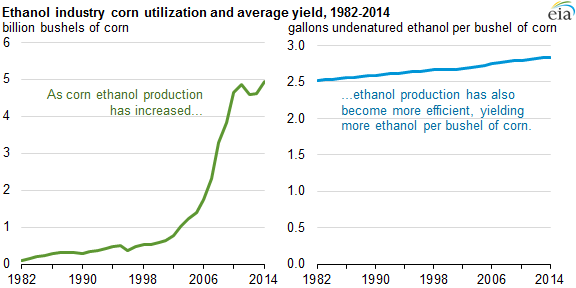 This growth in ethanol production has been made possible by a rise in demand for ethanol to increase octane levels as MTBE (methyl tert-butyl ether, a gasoline additive) has been phased out of gasoline, and to meet Renewable Fuel Standard (RFS) targets enacted in 2005 and expanded by subsequent legislation in 2007. RFS requirements effectively placed a floor under ethanol demand. Recently, ethanol's volumetric share of total U.S. motor gasoline supply has been just below 10%, reaching 9.8% in 2014.